We’ll be the first to admit that we’ve somewhat overlooked Malaysia these past few years. As a destination that both of us visited frequently in our early years of backpacking in South East Asia, it’s a bit ‘been there, done that’ for us. I will also sheepishly admit that we have been known to describe Malaysia as ‘boring’. Not as rough around the edges as Cambodia, or as off the beaten path as Myanmar, Malaysia is ‘nice’ and who likes to be described as ‘nice’? Recently we stayed with friends in Singapore. 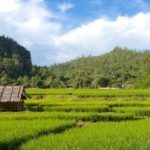 Our next destination was Thailand, and preferring to avoid both flights and journeys of more than a few hours, we decided to be true to our mantra of ‘stop the bus’ and took the slow route. This meant we could check out a couple of Malaysia’s lesser-visited towns; places that despite many visits to Malaysia, we had yet to explore. Sometimes we feel a little smug when we come across a hidden gem of a town, and Muar is one of those places. 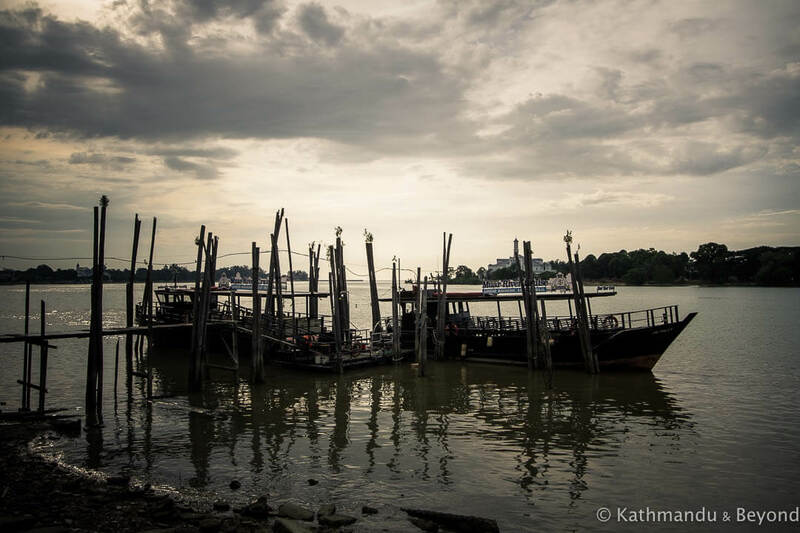 Located almost halfway between downtown Singapore and Kuala Lumpur, it’s hardly hidden but, for some reason, very few travellers put Muar on their itinerary. Also known as Bandar Maharani (the Town of Empress), the history of Muar dates back to the 14th century. 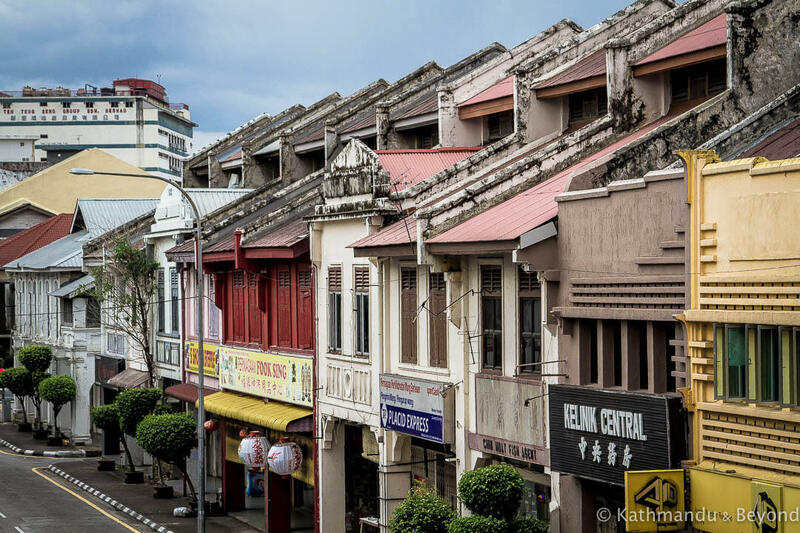 As a result, the town has a mix of architectural styles including buildings influenced by the British and traditional Chinese style shophouse, as well as more modern influences. The people of Muar are very proud of both their food and their coffee and are also incredibly friendly. Whilst wandering around the town we were constantly waved at and stopped and asked where we were from and what were we doing in Muar. In terms of sights, it’s fair to say there isn’t a long list of must-sees, but Muar is one of those sleepy little towns where you’ll be content wandering from noodle shop to coffee stand to hawker stall whilst soaking up the tranquility of the place. Although bigger than we’d imagined, downtown Muar is very manageable on foot. The town’s main landmark is the Clocktower (just west of the bus station) and from there it’s about a 20-minute walk along the Muar River to the Masjid Jamek Sultan Ibrahim (mosque). White and baby-blue-striped Jamek Sultan Ibrahim is Muar’s most important mosque. With a design more reminiscent of early 1900s colonial architecture than a traditional mosque, it’s worth the walk. On the opposite river bank is an almost identical mosque, built 70 years after its twin. Taking the river path to Jamek Sultan Ibrahim mosque, you will pass several colonial buildings such as the Old Court House and the Police Station. 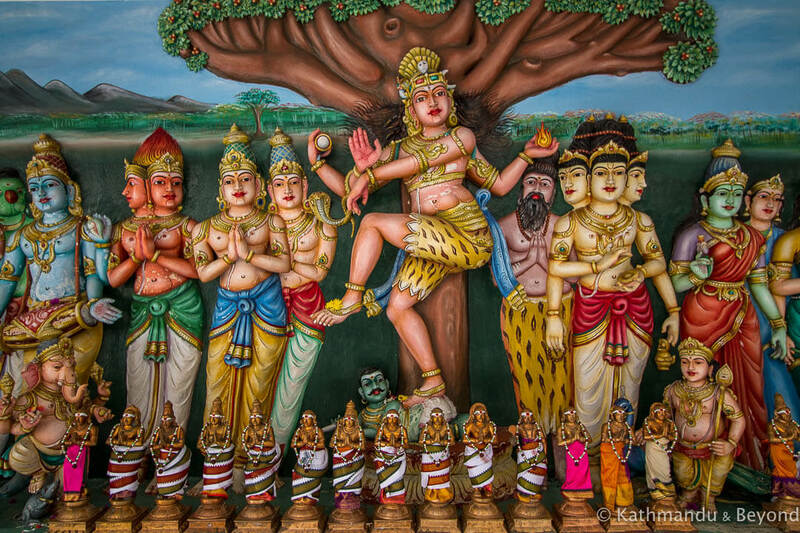 Cut in and make your way to the centre of town via the colourful Nattukottai Chettiars Sri Murugan temple, the oldest Hindu temple in Muar. It’s usually closed from late morning until around 5pm, so time your visit accordingly if you want to take a look at the ornately decorated interior. If you’re feeling peckish, head to the area around Jalan Haji Abu, which is aptly nick-named Hunger Street. Not ready to eat? 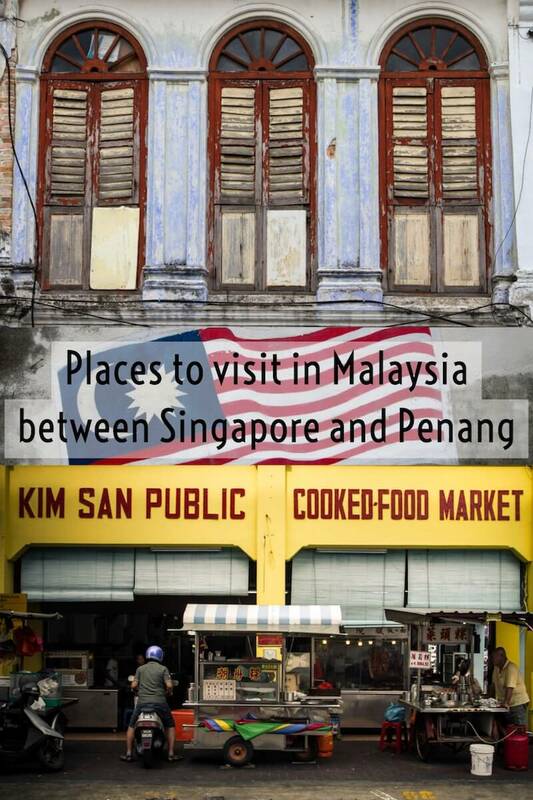 Admire the colourful old shophouses painted in hues of pink, yellow and blue. Or at least consider coffee or a fresh pear juice, both of which Muar is known to excel at. 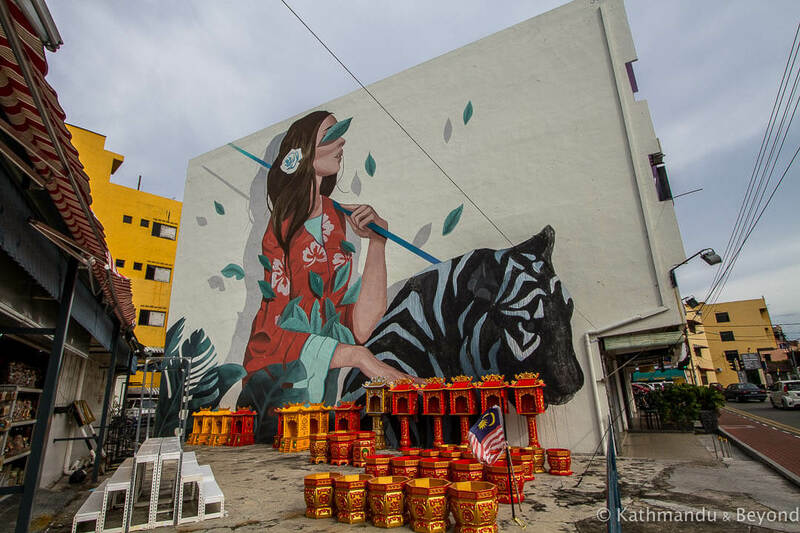 Although Muar is an off the beaten track destination in itself, for those looking for alternative things to see in Muar, we found a surprising amount of street art and even a reasonable smattering of 1960s concrete! 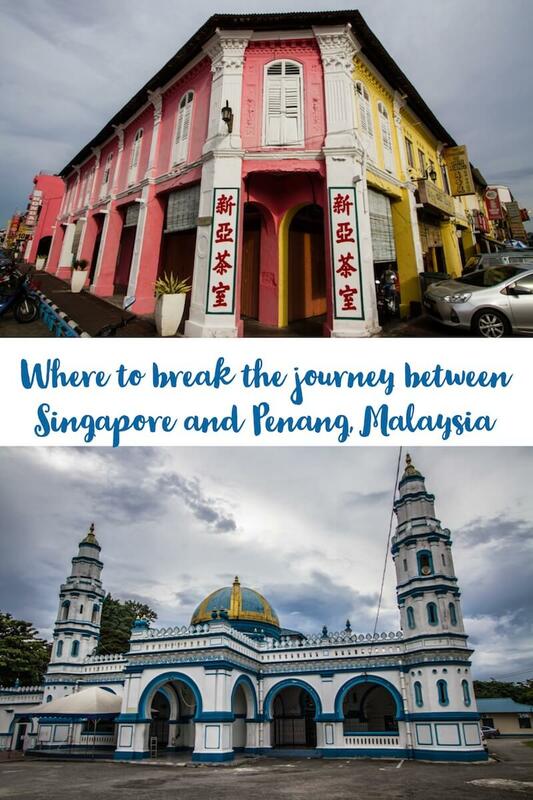 You don’t really need a map of Muar to find your way around, but this one by Malaysia Traveller covers all the places you might want to see: Map of Muar. We stayed at the Ban Loong Hotel where we had a huge double room with private bathroom and air-conditioning for 90 MRY (approximately £16/€18/US$21). Location-wise, it was a little bit further out of town than we ideally like (it is also on the opposite side of town from the bus station), but it was manageable and we still walked everywhere in Muar. Other than the location, we didn’t have any complaints. We travelled the 190 km from Singapore to Muar the cheapest possible way, using public transport: we took a bus from downtown Singapore to Larkin Bus Terminal in Johor Bahru on the Malaysia side of the border. From there we took another bus to Muar. Crossing the border took a long time, and the total journey time, including immigration formalities, was around 4½ hours. Getting from Muar to Melaka or Kuala Lumpur (KL) by bus is easy. 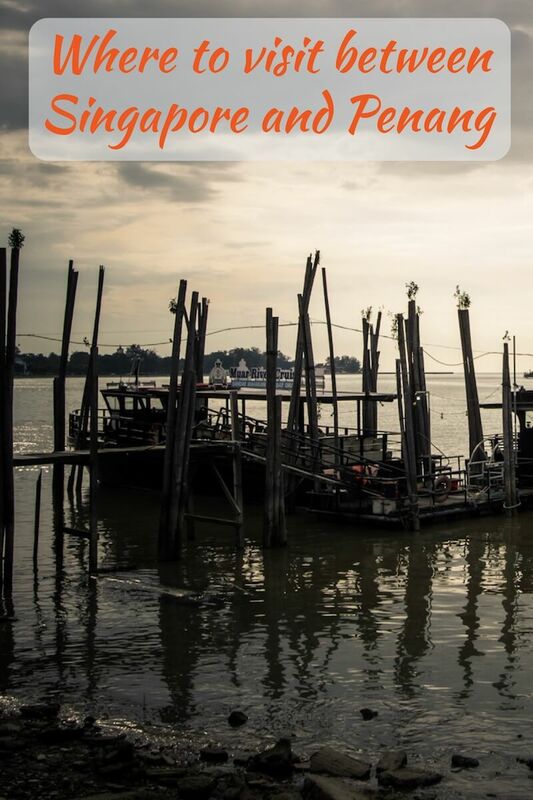 Although there are buses about every fifteen minutes from Muar directly to KL, there are only around four buses a day from Muar to Melaka, so don’t forget to check the schedule when you arrive in Muar. The journey shouldn’t take longer than 1½ hours. I first visited Malacca (the modern spelling is Melaka) some 25 years ago. At that time I stayed in a house on the river, a little away from the centre and grazed on coconuts freshly picked from the garden. 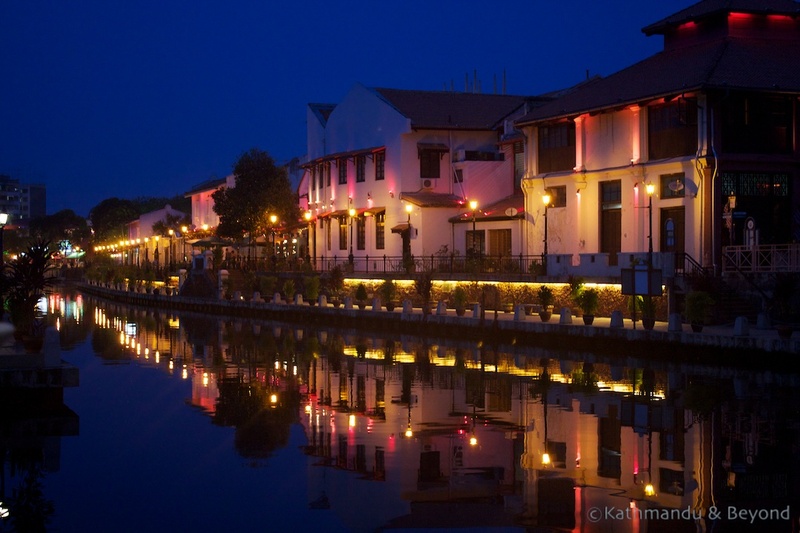 Since then, Melaka’s popularity has grown hugely but it still hasn’t lost its charm. Sharing a UNESCO World Heritage status with Penang, and listed as ‘Melaka and George Town, Historic Cities of the Straits of Malacca’, this once important trading port is a melting pot of Malay, Chinese, Indian and European heritage. To mix things up more, the European influence came first from the Portuguese, then the Dutch and finally the British, over a period covering 437 years. For us, Melaka’s appeal is the food and the architecture. It’s just dawned on me that every entry is going to mention the food as a highlight but that’s Malaysia in a nutshell (or should that be a coconut shell?!). The eclectic mix of architecture is best appreciated on foot, following the town’s Heritage Trail (you can pick up a map at the Tourist Information Centre), visiting China Town and the Old Town. 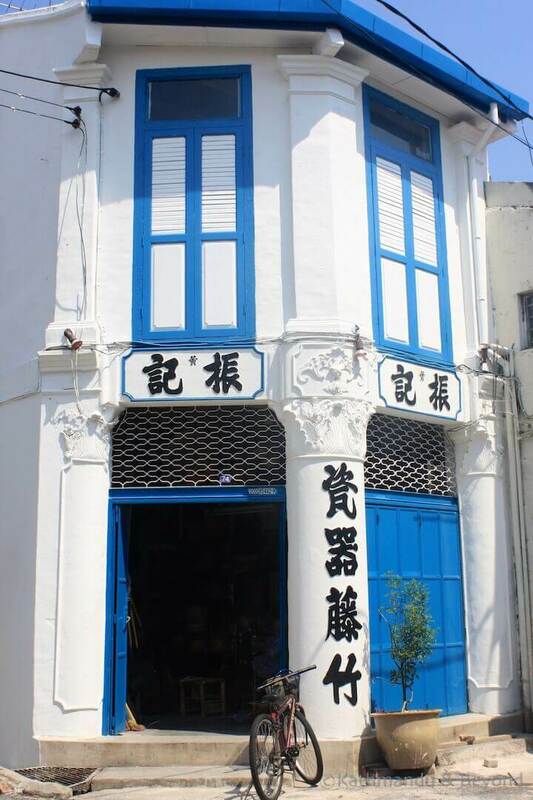 And when you’re ready to start eating, head to Jonker Street. Depending on your interests, there is plenty to keep you occupied for a few days in Malacca. We’re not so into museums, but if you are, you’ll probably need to stay a week! If you only visit one museum it should be the Baba-Nonya Heritage Museum where you can learn about the history of the region. 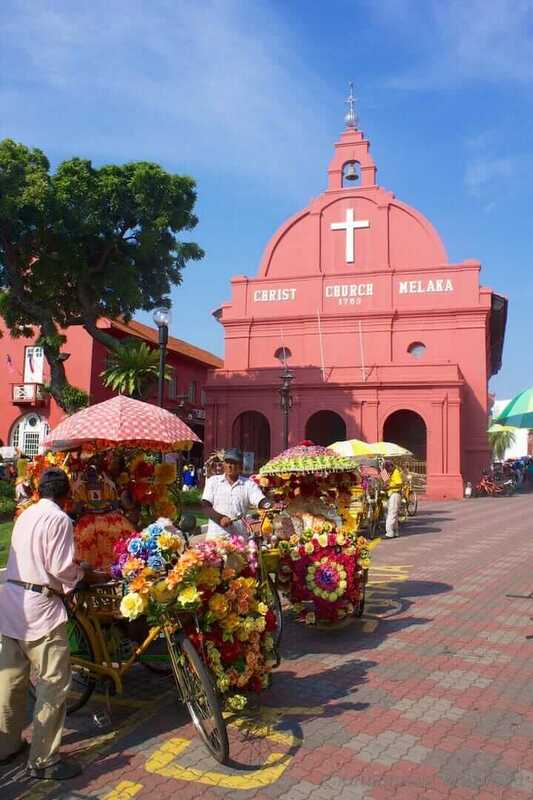 Other ‘must see’ sights in Melaka include the Stadthuys (a Dutch-built historical building), Dutch Square, historic Christ Church, and the 17th century Cheng Hoon Teng Chinese temple. We enjoyed walking along the river that cuts through the town, particularly at nightfall when lights from the traditional houses produce a photogenic reflection. There is also a thriving street art scene in Melaka which I have yet to fully appreciate since it has mushroomed since our last visit to the city, around four years ago. A lot of murals can be seen from the riverbanks, and the narrow alleys in the old town are another good place to go street art hunting. This will contradict our warning below about weekend travel, but if you do find yourself in Melaka over the weekend the Friday, Saturday and Sunday Jonker Walk Night Market is worth checking out for its variety of street food and the opportunity to do a bit of souvenir shopping. We were once in Melaka over Ramadan, and our hosts were observing the traditional sunrise to sunset fast. One afternoon they invited us to go to with them to the Ramadan food market to pick up that evening’s dinner. Known as Bazaar Ramadan, it’s not surprising that a food-loving nation such as Malaysia breaks its daily fast in the most mouth-watering of ways – the market had a staggering array of ready-cooked dishes on offer. Held all over the country, if you are in Malaysia during Ramadan (calculated to be 15 May to 14 June in 2018), be sure to seek out the local Bazaar Ramadan. Planning Tip: Malacca is no longer a diamond in the rough and as a tourist destination, it has been well and truly discovered. We recommend trying to visit mid-week unless you want to join the weekend crowds escaping nearby Singapore, Kuala Lumpur and everywhere else within easy reach of an Air Asia flight. 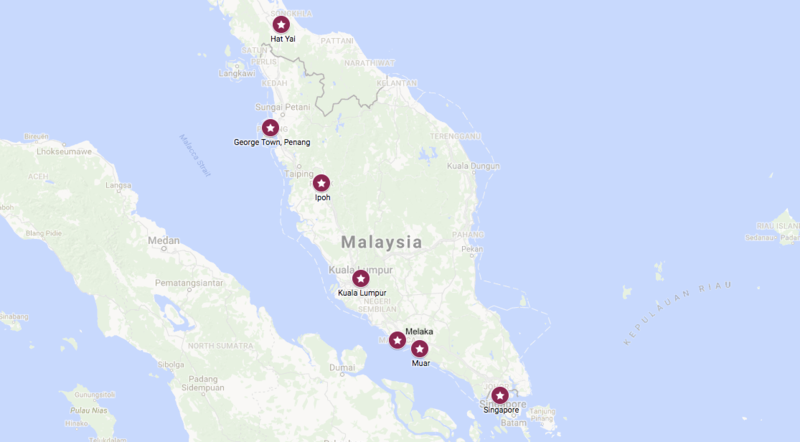 This map by Malaysia Traveller marks out Melaka’s Heritage Trail. Melaka has no shortage of street food, local restaurants, cafes and drinking spots and this guide will point you in the right direction. Having paid Melaka a visit on several previous trips to Malaysia we decided to skip it during our most recent journey through the country. Last time, we stayed in a really friendly little place which backed onto the river but, unfortunately we can’t remember its name! Luckily, there is no shortage of highly rated hostels and guesthouses listed on Booking.com and other online booking sites – if you have stayed somewhere recently that you recommend, let us know in the comments. Buses to Melaka from Kuala Lumpur are frequent and the journey takes approximately 2½ to 3 hours depending on the traffic. It’s also possible to get a bus directly to and from KLIA International airport which is south of the capital. We have mixed feelings about KL. It’s a city we have passed through on numerous occasions but somehow we’ve never got to grips with it; possibly because we have never spent enough time there to get to know it. Despite that, our recent visit again ended up being far too brief as we discovered KL has its fair share of Brutalist architecture and other concrete. 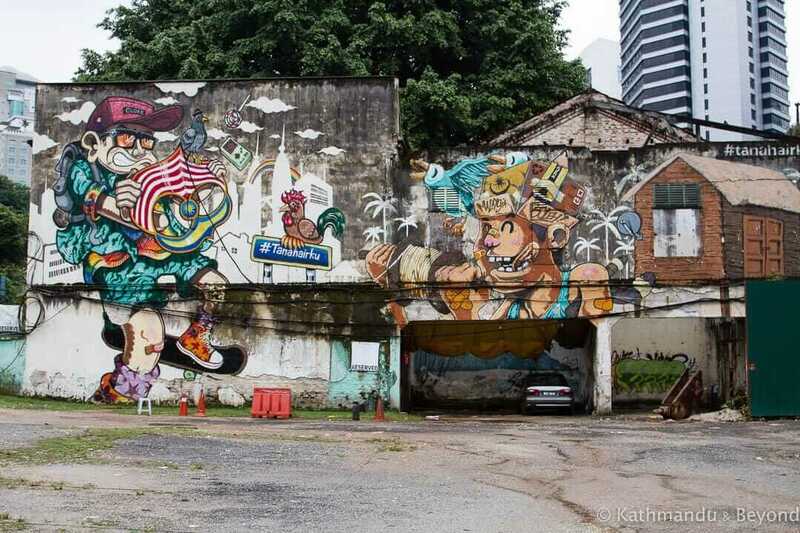 I also researched KL’s street art scene but found it surprisingly lacking compared to much smaller cities in Malaysia. 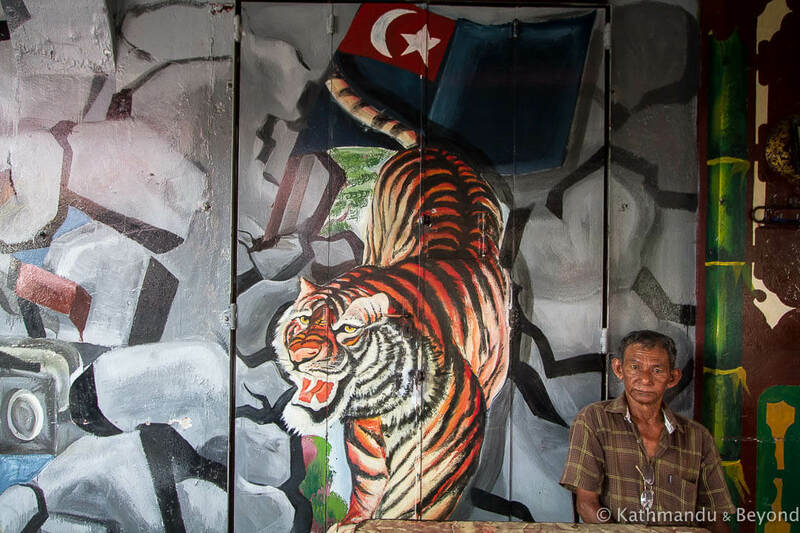 We did find a handful of art, and I’m sure we would have found more if we’d had more time and looked a bit harder, but it’s not as obvious as it is in many other, much smaller, Malaysian towns. My groundwork did throw up an area a little outside of the city called Shah Alam, which seems to have a good street art scene, and I was kicking myself for not allowing enough time to get there. 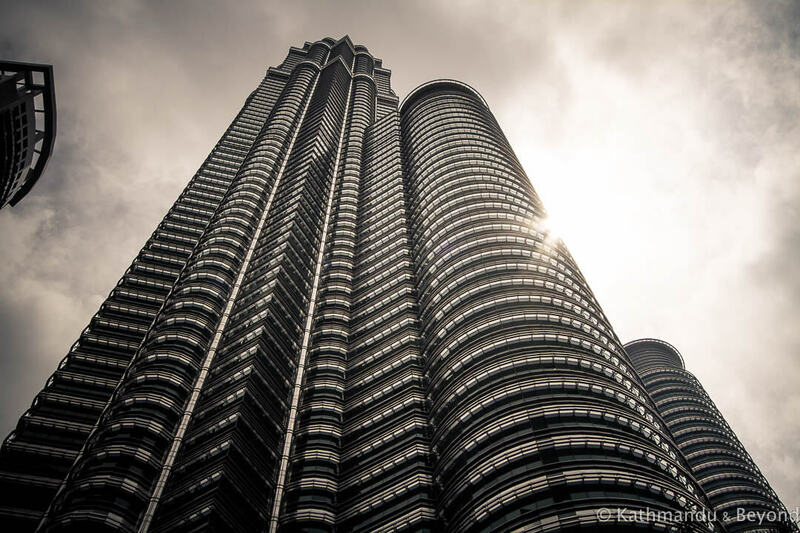 One of the reasons we’ve never lingered in KL is that we’ve always found budget accommodation there unacceptable – often dirty, paper-thin walls and pricey for what you get compared with other places in South East Asia. I don’t know if budget hotels in KL have improved greatly due to competition or if our budget has sneaked up sufficiently over the years to buy us a better deal, but this time around we were happy with our accommodation choices. Our visit to KL was punctuated by a trip to Brunei, so we stayed in two hotels in slightly different locations. We chose both for their convenient access to public transport and the Big M Hotel was just across the road from the Masjid Jamek subway station whilst M&M Hotel was in the Brickfields area of town, very close to KL Sentral railway station from where you can catch local and nationwide trains and the airport bus. At both hotels, our rooms were just about big enough to swing the proverbial cat but they were clean with contemporary decor, air conditioning and private bathrooms. We took the train from KL to Ipoh, a journey of 2 hours and 15 minutes. There are, of course, buses but we always take the train over a bus if is it an option. If you travel by bus, you will arrive at the Amanjaya bus terminal a few kilometres out of the city. You can get a local bus there from the Medan Kidd bus station which is a short walk from the railway station. Ipoh’s profile has been raised considerably this past year. 2017 was designated as ‘Visit Perak’ year and Lonely Planet included Perak in their list of top ten regions to visit in 2017. Persuaded by friends who had recently visited the city, we added Ipoh to our Singapore to Thailand overland journey. As soon as I started reading about the street art there, I knew it was the right decision! 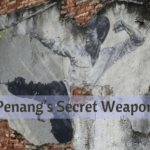 Ipoh turned out to be a very good choice: colourful shophouses, enough street art to give Penang a run for the money, a healthy dose of concrete and modernist architecture, as well as a Little India and a Chinatown. 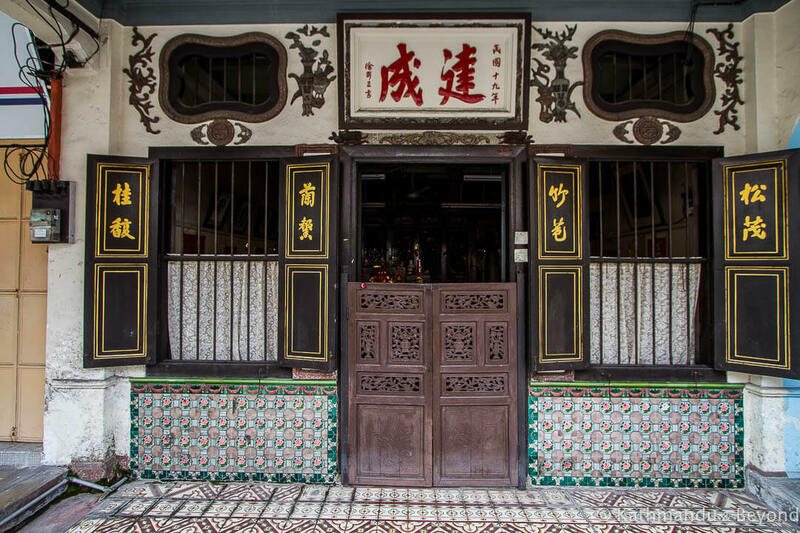 In our opinion, Ipoh has all the makings of being the new George Town; except without the crowds of tourists. Thanks to a schedule change by Air Asia, our time in Ipoh was shorter than originally planned. We didn’t see as much as we wanted but we made the most of what time we had, spending much of it exploring the compact old town on foot. Two of Ipoh’s mosques are worth a look for their opposing styles. Built in 1898, the Panglima Kinta Mosque is one of the oldest in Malaysia. Its eclectic design supposedly incorporates British, Moghul and neo-classical architecture! The second, Sultan Idris Shah II, is a complete contrast. Built in 1968 as the State Mosque of Perak, its modern design verges on Brutalism. 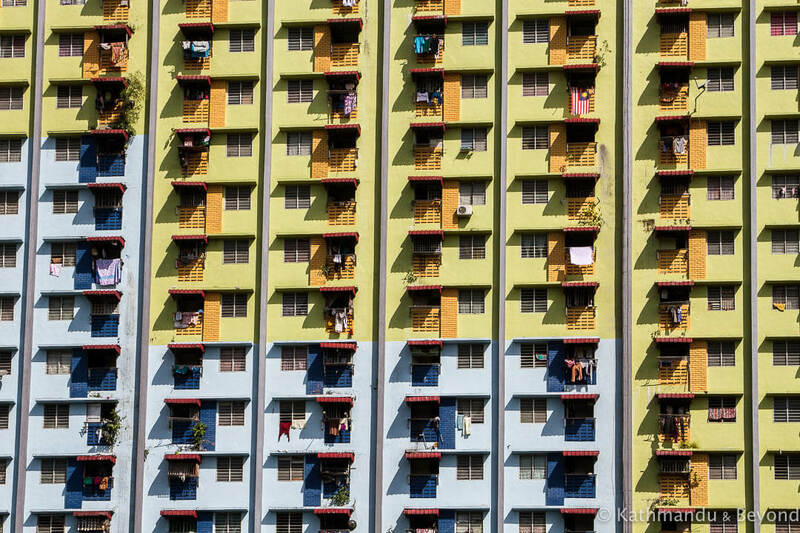 Much to Mark’s excitement, Ipoh held several concrete architectural delights including Kinta Heights, a huge apartment block built as social housing in the early 1980s but regarded by some locals as a major eyesore. 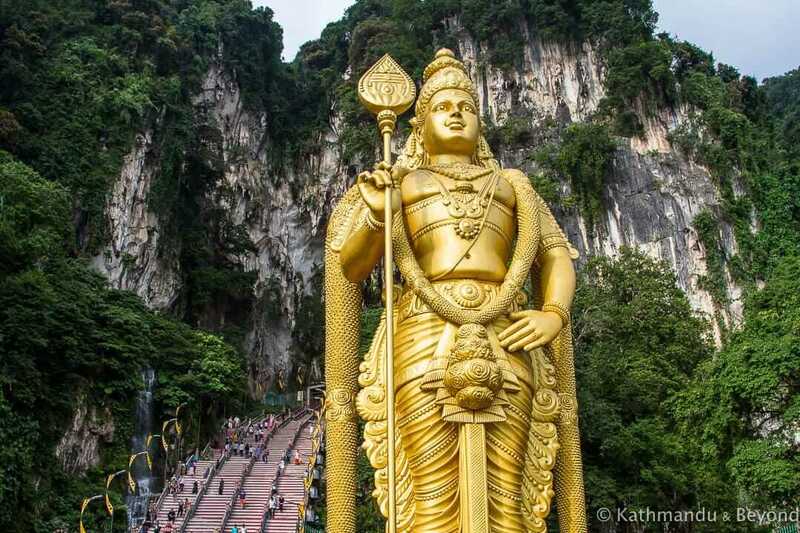 One highly-rated Ipoh attraction and the reason most tourists go in the first place is Ipoh’s Cave Temples – Sam Poh Tong (the largest in Malaysia), Perak Tong and Gua Kok Look Tong grottoes are all within reach of Ipoh. The post I’ve linked to below gives details on how to get to them. And then there’s the street art! 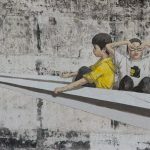 The Old Town is splashed with several pieces by Lithuanian artist Ernest Zacharevic, who also left his mark on Penang, and next to Panglima Kinta Mosque is an alleyway packed full of colourful murals. 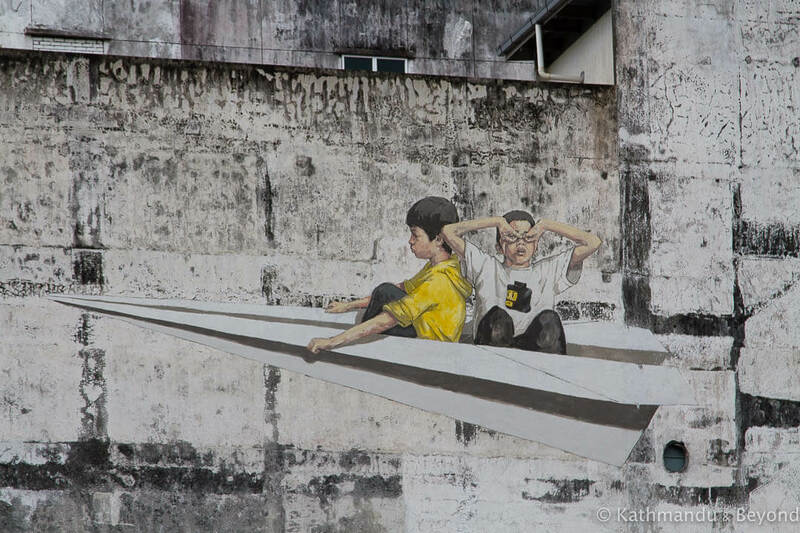 Read our post about Ipoh’s street art. It’s hard to beat this comprehensive post on what to do in Ipoh by Tiki Touring Kiwi. We stayed at the Ban Loong Hotel which has a convenient location in the Old Town. 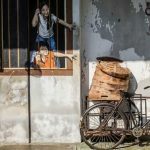 The Ban Loong is a converted Chinese shophouse and rooms share a common bathroom. It was clean and comfortable, and we’d stay there again. Travelling by bus or train to Penang is easy, but once again we’d recommend the train, for comfort. By rail, you will arrive at Penang’s Butterworth Station from where you can take the short ferry ride across to George Town. Most buses also arrive into Butterworth – some terminate at Sungai Nibong terminal which is on Penang island, about 10 kilometres south of George Town, so if you take the bus, double check where it’s headed to. The train takes a little under two hours and the bus a little over. Having visited Penang many times previously, on this occasion we took a bus from Ipoh directly to Hat Yai in Thailand. The journey was supposed to take around 5½ hours, but immigration was a mess and it ended up taking closer to 7 hours. You can also travel by rail, changing trains at Padang Besar. For buses and trains across Malaysia and into Singapore or Thailand, Easy Book is one of the most straightforward online booking websites we’ve found. Simply book your tickets online and report to the bus company half an hour or so before your departure time to exchange your booking advice for the actual tickets. You can also check schedules and book online directly with KTM Railways. As always when it comes to South East Asia, Travelfish provide a lot of online up to date information. Did you ever make it to the lowland jungle national park in the center of the peninsula called Taman Negara, which if I remember correctly translates to “National Park”? I got there from Kuala Lumpur by bus, then train, then boat. There also is, or probably was, as I was there 25 years ago, a great train journey from there north — a slow moving, rickety old local train through beautiful jungle. Fantastic read, thank you! My husband and I visited Ipoh for the first time recently having previously visited Penang and Malacca on more than one occasion: I don’t understand why more travellers don’t make it to Ipoh, it’s so underrated! Thank you. 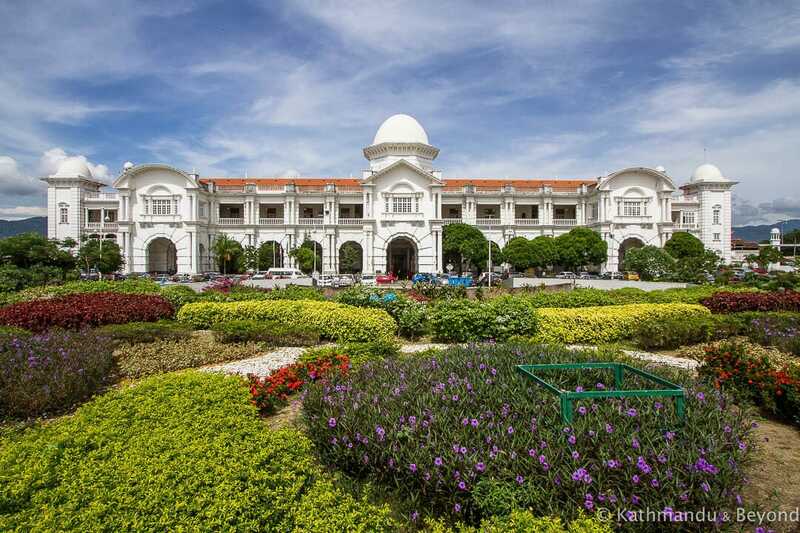 Yes, we agree – Ipoh is so easy to get to and yet so many travellers seem to bypass it. Our time was far too short there and we definitely plan to spend more time in Ipoh in the future.